Several months ago a small group of Facebook users in Scottsboro, AL began tossing around ideas of ways to breathe life back into the small town. 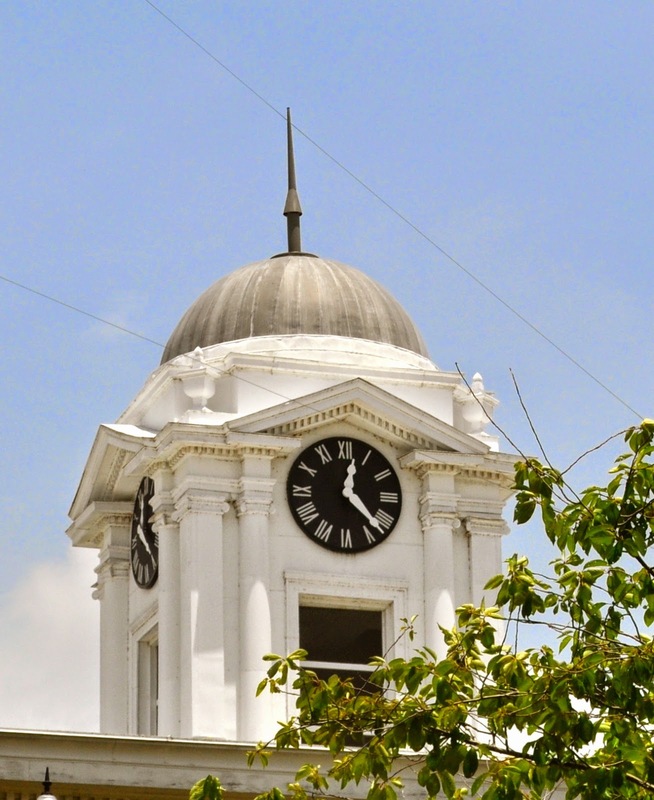 The conversation started when residents received news that Scottsboro and surrounding Jackson County had been awarded grants in the range of one million dollars to renovate the downtown square. Suddenly, people began imagining a change in the town and there was reason to believe some of the ideas could become reality. A million dollars was a tangible hook on which hopes and dreams could hang. One of those citizens, Nat Cisco, was inspired to form a Facebook page called, Revive, which had the express purpose of generating positive ideas for improving the local economy and supporting the town's businesses. From Revive, a second group, Downtown Scottsboro, was created. 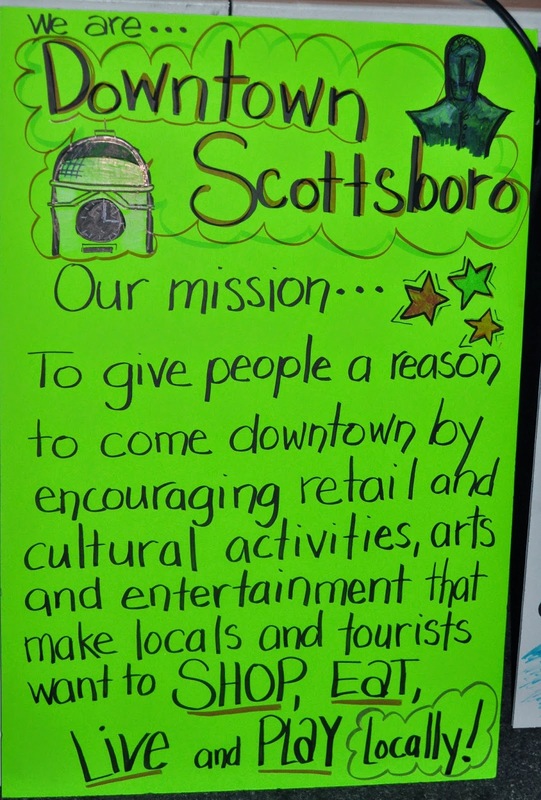 Downtown Scottsboro's mission is to establish an arts and entertainment district around the historic old downtown square. While Revive has fueled ideas for the improvement of all areas of the town, Downtown Scottsboro has a more narrow focus. The idea was to start in the heart of the city and grow the economy from the inside out, to encourage shopping, dining and entertainment around the square and bring people back to the city's roots. Now Revive and Downtown Scottsboro have been the impetus behind the formation of Scottsboro's Downtown Redevelopment Authority. The Downtown Redevelopment Authority is a government entity that can search for and accept grants to be used for downtown revitalization. So, while Revive and Downtown Scottsboro can come up with ideas and ways to put those plans into action, the Redevelopment Authority can actually generate the money needed to make the ideas come to life. The DRA has already acquired property on the square. After a fire had destroyed a narrow building, leaving a burned out alleyway, a false front had been added to improve the appearance of the charred hull, but nothing else had been done with the property. This alleyway was given to the DRA to be used to to the benefit of the downtown area. Ideas for the best use of this property are still being discussed. This is a true grassroots movement at its best and social media has given it wheels. But, it all still boils down to the heart of the local citizens. Any movement is only as good as the commitment, drive, support and determination of the residents. In that regard, Scottsboro is showing itself to be blessed. In just a few short months, since the birth of Revive, it is evident that change is afoot in the city of Scottsboro. The change began to become noticeable when one concerned resident, Richard Matthews, offered to give the beloved Variety Bake Shop a facelift. As you can see from the photos above, the change is dramatic and graphic evidence of the ability of one person to make a difference. Not only has Scottsboro welcomed a brand new business, Nerdtopia, to the downtown area, we've noticed a brightening of other buildings around the square. A little paint here, a little repairing there...each and every bit beginning to make a difference, and all of this before even one penny of the million dollar grant money has been used. Additionally, Downtown Scottsboro has thrown a downtown Movie Night on the Square and is currently working on a Christmas extravaganza, Jingle Bell Square. Both of these events were designed to give the local citizens a reason to come together and enjoy themselves in the city's historic downtown. The group plans to host more downtown events with the hope that these events will give the current businesses on the square a boost and help encourage the growth of new businesses in the area. Change is not immediate and growth takes time, but all it takes is for one tiny spark to take hold and the people of the town to fan the flames for that spark to turn into a blaze. We will be watching to see if Scottsboro can make good things happen, but right now, the signs are looking bright. Three Friends and a Fork will be cheering the progress every step of the way. Light the fires, Scottsboro! Fan the flames, Jackson County!